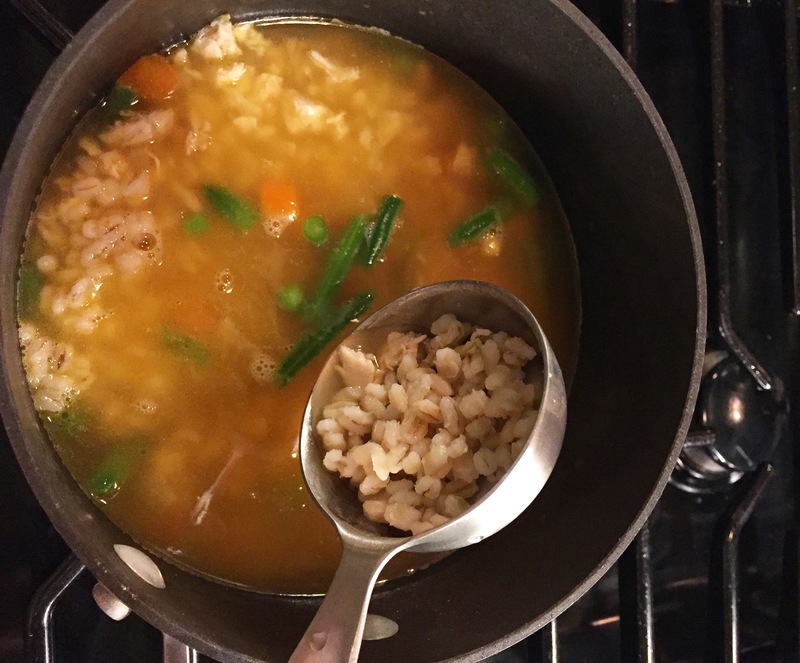 What: A simple and classic soup for your little one made with a little bit of everything you’ve got leftover – a bit of cooked chicken, some pre-cooked barley (I make a big batch every Sunday to add to salads and to use as a base for toddler meals – it stores well in the fridge for up to four days). Grab some frozen vegetables from your freezer and a carton (or BPA-free can) of Chicken Stock and you are halfway to souptime. When: Whenever you’ve got a small amount (a half cup, to be exact) leftover poultry (or even pork or beef) and some extra grain (rice, barley, farro, orzo – you name it). Adapt this basic method to the ingredients you have on hand. Why: Nothing’s more satisfying than soup in the winter. How: Spend 10 minutes by the stove and then fridge, freeze or serve! In a medium pot, melt Butter over medium flame. Add diced Onion and sautee, stirring occasionally for about 3 minutes until fragrant and the Onion begins becoming translucent. Add Chicken Stock and Water. Turn up the heat a bit and allow the liquids to come to a boil. Add the frozen Vegetables and allow to boil about a minute before lowering to a simmer. Add the prepared Barley and cooked Chicken. Season with Pepper and then add 3 large pinches of Salt. Sprinkle with optional fresh Herbs and serve!